This Classical journey offers you glimpses of North India. 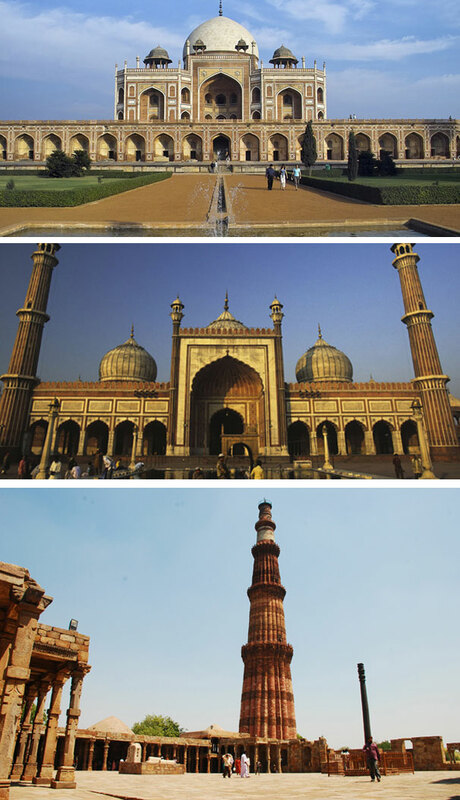 Delhi, Agra and Jaipur form the traditional tour of a basic trip to India what is commonly called “Golden Triangle”. These cities offer the guest an insight into the multi-faceted face of India. All these cities have the finest in facilities for incentives and meetings of all sizes. 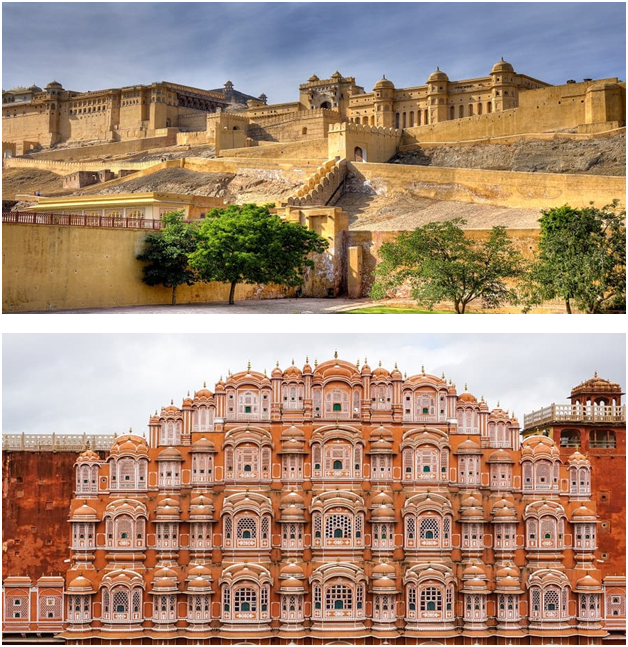 From palaces and forts to small palatial mansions, there is something for everybody. The tour of course includes visits at sunset to the magnificent Taj Mahal. In Jaipur, Caparisoned Elephant ride up the Amber Fort relives the yester years of the desert kingdoms. Magnificent Shekhawati The semi-desert region, this tour is designed to give a first time visitor the very best India has to offer in the short time they are here. Morning proceed on a tour of New Delhi was designed and built by the British in the 1920's - it's a city of wide boulevards impressive Government buildings, green parks and gardens. In 1911 King George V announced the transfer of the capital from Calcutta to Delhi. The King's architects, Lutyens and Baker, set in motion the Design and construction of Delhi's eight cities - New Delhi. Lutyens designed an "Imperial City" having palatial-sized buildings set amid broad tree-lined avenues punctuated by Mughal style gardens, complete with fountains and shallow pools. It took 20 years to complete this immense undertaking only to have the British pack up and relinquish the subcontinent in 1947. You will visit the monuments from Delhi's past & known as two of the 26 World Heritage sites of India - Humayun’s Tomb and Qutub Minar. Your drive takes you along the ceremonial avenue, past the imposing India Gate, Parliament House and Rashtrapati Bhavan, the official residence of the Indian president. Morning we take southbound Gatimaan Express at 08.10 hrs arrive Agra at 09.50 hrs.you will be meet by our representative at station transfer to hotel. Agra - at the time of the Mughals, in the 16th & 17th centuries, Agra was the capital of the grand Mughal Empire. During this period the city became a leading centre of art, science, commerce and culture. 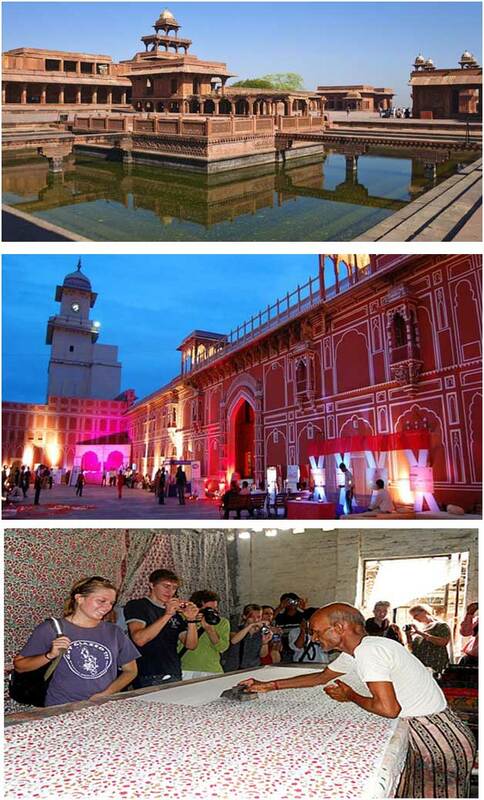 Akbar the Great made Agra great. The city's origins are dim but Akbar's grandfather Babur is credited with Agra's founding. Today visit to Itmad-ud-Daulah built by Empress Noor Jehan in the memory of Her Father. 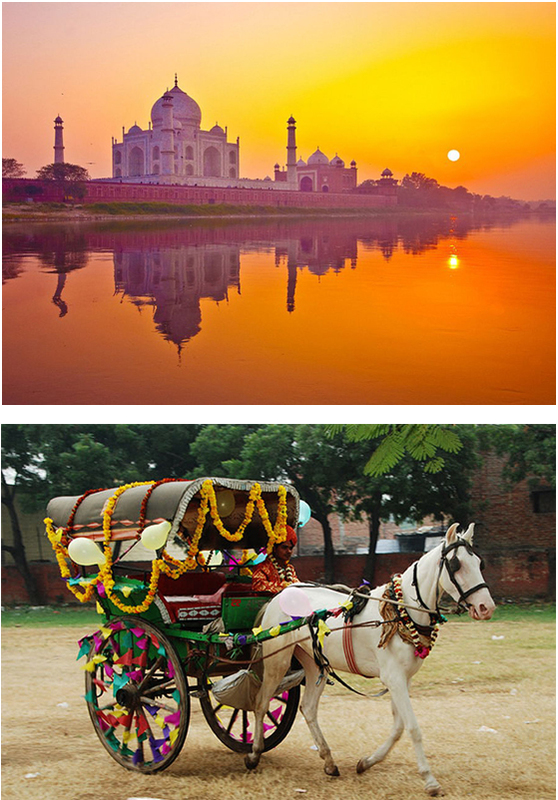 Evening take Horse cart (Tonga Ride) to the Magnificent Taj Mahal – The New 7 wonder of the world and Monument of Love in the warm glow of Sunset, which was built in 1630 by Mughal Emperor Shah Jahan as a tomb for his beloved wife Mumtaz Mahal. Construction of the Taj Mahal began in 1631, and is believed to have taken 18 years to complete, with over 20,000 craftsmen working around the clock. The design and construction is said to be that of the legendary architect, Ustad Ahamad Lahori. Legend has it that once construction was completed, what makes the Taj Mahal unique is its perfect proportions, distinct femininity, medium of construction and ornamentation. Its marble exterior reflects rose and golden tints at sunrise and sunset, while it is dazzling white during the day. It is impossible to visualize the Taj Mahal in any surrounding others than its paradoxical garden. Paradise, in Islam, is visualized as a lush garden where running streams flow. When the Mughal brought this concept to India they elevated it to heights of Incomparable artistry. After breakfast proceed to Jaipur. Through the Rajasthani countryside we see villages, woman dressed in the brilliantly colored saris of the region, Camels, Elephants, Bears & scenes of rural lives. On the way you will visit Fatehpur Sikri - the deserted red sandstone city that was built by Emperor Akbar as his capital. Ponder the mysterious desertion of this capital city that was dramatically abandoned a few years after it was built. It was a veritable fairy tale city and its 'ruins' are still in a pristine condition. It is not hard to imagine what the court life must have been like in the days of its grandeur of Shah Jehan, mastermind of the unforgettable Taj Mahal. 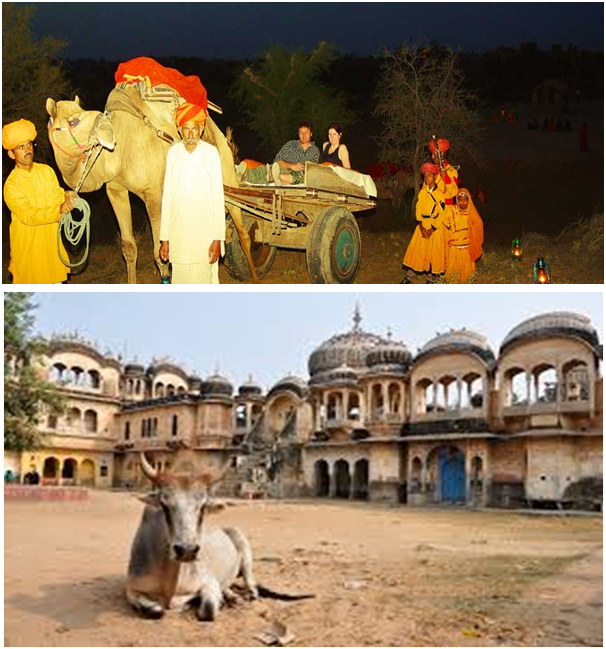 Today drive to (Shekhawati) Mandawa - The region lies the triangular area between Delhi, Jaipur and Bikaner and includes Jhunjhuniun, Sikar and Churu districts of Rajasthan upon arrival check in to Hotel. 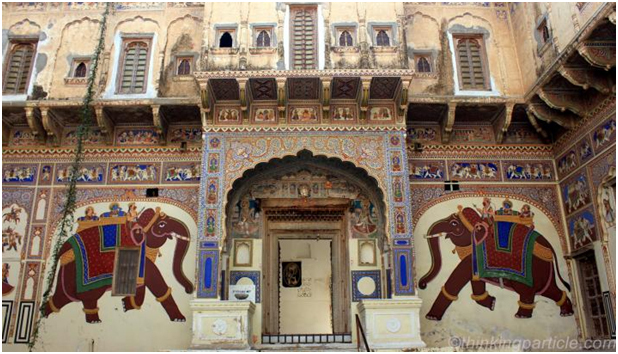 After breakfast combined sightseeing of 2 remote areas Nawalgarh - Founded in the 18th Century by Nawal Singh, it has some of the finest frescoes in the Shekhawati region. A huge fort with a colorful bazaar and numerous Havelies with elaborate architecture make it an interesting destination. There are a few prominent Havelies like Anandilal Poddar Haveli, Aath Haveli, Hodh Raj Patodia Haveli, etc., which are to be visited, as also the two forts. The painting in their Art Gallery is a great visual treat.